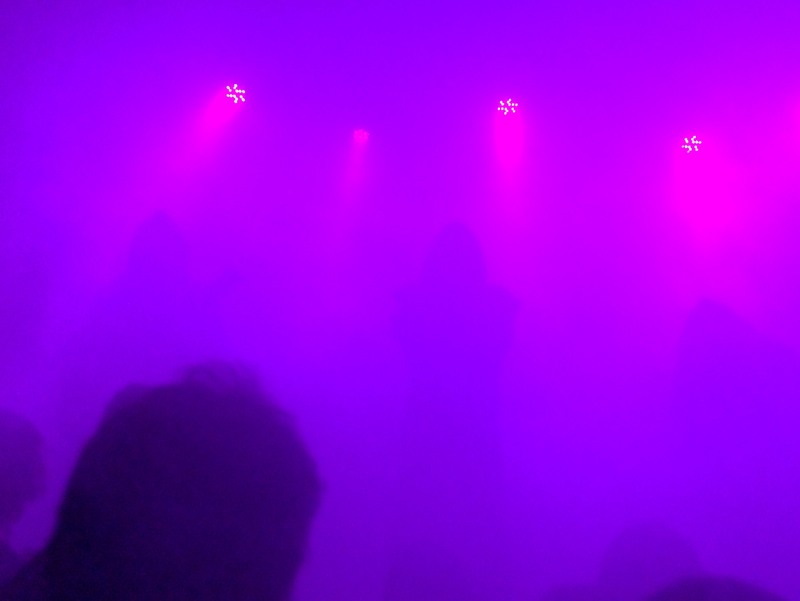 “Maximum volume yields maximum results.” This is printed on every rider and stage plot Sunn O))) sends out to venues in advance of their shows. Not many bands can claim to have a motto, but it’s the most fitting summation of this act you’d ever need. Opening the show is Montreal’s own Big|Brave with a polished and appropriately doomy set. Thunderous drums and heavy, ponderous riffs carry the plaintive vocals, expertly setting the mood and giving the headbangers a chance to get it out of their systems while they can. This will be the one and only time such familiar musical hallmarks as rhythm, melody, and discernible lyrics make an appearance tonight – we’re heading somewhere much weirder. 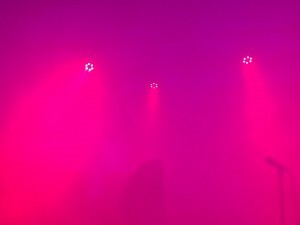 There is a long stretch between the acts as the smoke machines are pushed to their limits, and a thick haze settles over the crowd. Dim red lights pulse and a guy near me takes the opportunity to sneak a cigarette. This innocuous subversion feels significant: we’re entering new territory and losing some rules and markers along the way. Those of us in the first half-dozen rows can barely see the bodies around us, let alone the stage. We’re retreating into ourselves and losing sight of everything else. Before anyone even realizes the group has taken the stage, sound begins to fill the room. It is the voice of Atilla Csihar, guttural and droning. His range is magnificent, dipping down into a rich throat hum steeped in overtones, leaping up into chanted invocations which might be Hungarian or might be a dead language from a forgotten dimension. As the smoke clears we see there are others behind him, manning guitars and synths; they are all hooded and cloaked, moving slowly and with purpose. The sound swells and drowns the voice in a billowing roar and our earplugs are in, the unprepared quickly realizing their unfortunate mistake and clasping their hands to the sides of their heads. Overused as the cliché may be, this is more than music. This is an experience of sound at its most primal level, a crash course in the physics of vibration. It is felt in the body as much, or perhaps even more, than it is heard in the ears. It rattles your bones, warps your gut. The skull buzzes, ears pop. The sheer volume elevates sound into physical reality, unfurling from the wall of stacked amps like a standing wave. Beyond the novelty of noise, the stage presence is worth mentioning. It feels less like a performance for our benefit and more like a glimpse into their own intimate ritual – and not just because they’re all dressed like druids. These men are participating in something special and deeply personal. They pass around a bottle of water like a sacrament, all motions careful and deliberate. One or two or three members at a time come and go from the stage; at one point both the guitarists are gone and we are treated to a much lighter passage of synth and horn, which only deepens the impact when the guitars drop back in. This entry was posted in CKUT programming and tagged Big Brave, heavy, SAT, SunnO))) on March 21, 2017 by CKUT Music Coordinator. 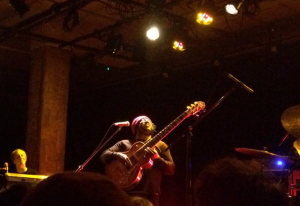 An unseasonably warm and rainy winter night saw the ground floor of the SAT packed nearly to capacity to bear witness to the groove of Brainfeeder artist Thundercat. While touring on his latest release, the excellent Drunk, his Montreal stop did not disappoint the significant crowd that ventured out to catch the show. Plowing through a slew of midtempo sluggers, Montreal’s Lexis opened the night on a setup combining DJ and live beat techniques. In keeping with the headliner’s home base, a good portion of the set was rooted LA’s brand of cosmic-jazz-bop, with the undeniable influence of Dilla and Flying Lotus (himself a frequent Thundercat collaborator) on display. Armed with his signature six-string bass and clad in a fluorescent orange toque and long underwear bottoms, Stephen Bruner wasted no time between sets before ambling onstage and launching confidently into an onslaught of blistering, frantic jams. Working around his effortless falsetto, the band darted unceasingly between solid pop passages and meandering virtuosic detours, early standout “Tron Cat” being an example of this electrified dynamic. Only midway into the set when the tempo dropped into the satisfying stomp of crowd-pleaser “Them Changes” did everything fully settle into place. From that point onwards it opened up, becoming a little looser and more relaxed. The project’s inherent playfulness bubbled up to the surface with increasing ease, as on a cheeky instrumental cover of Kendrick Lamar’s “If These Walls Could Talk” (Stephen having contributed to the original source material), among many other memorable moments. 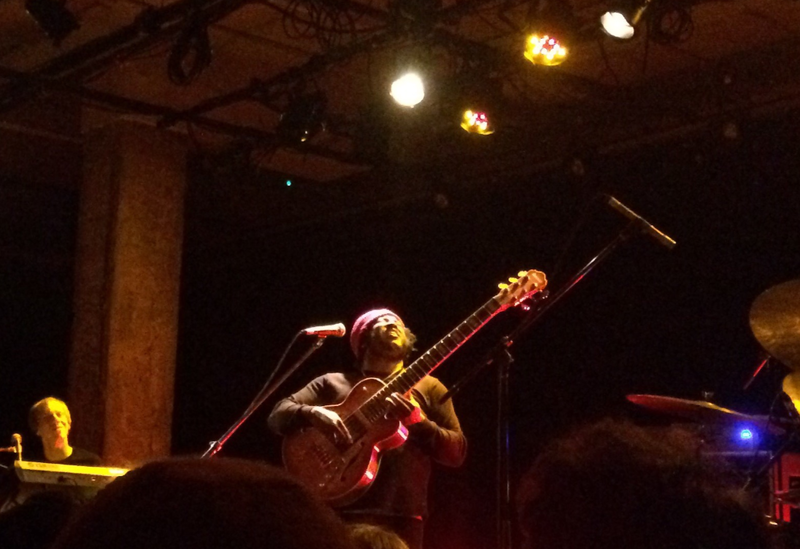 The room was balmy, the audience dazzled, the funk undeniable. You should have been there. This entry was posted in Reviews and tagged Brainfeeder, SAT, Thundercat on March 6, 2017 by CKUT Music Coordinator. Last Friday Flying Lotus sold out the S.A.T. on Saint-Catherine street in Montreal leaving a lineup of disappointed fans out in the cold. Psychedelic two-layered visual projections enhanced the music tenfold, though at the end of the night cheers for an encore had no avail after a notably short FlyLo set clocking in at 70 minutes. Steven Ellison meandered through a good chunk of his new material from ‘Until The Quiet Comes’ while dropping in a few older tracks and pop references of Beastie Boys and Radiohead. He also dished out a bajillion high-fives to eager fans and hyped up gamers in the audience with an out-of-left-field Mortal Combat sample (“GET OVER HERE!”). Understandably, FlyLo’s more sensitive songs were left off the set list to keep folks feet moving. However, opener Teebs impressed me and clearly many more. With an array of dynamic shifts, the artist less commonly known as Mtendere Mandowa expertly swept filters and tweaked beats on a sampler not so different from the one used by J Dilla on 2006’s ‘Donuts’. Both artists are on Brainfeeder records, you can find them and their music right here. 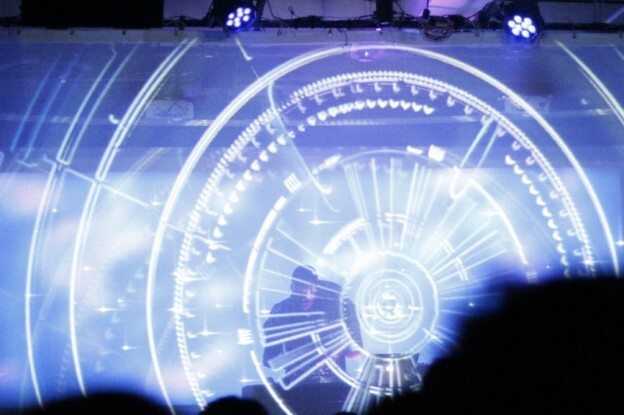 This entry was posted in Reviews and tagged flying lotus, SAT, Show Review, teebs on October 17, 2012 by gabriel. My friends and I arrived at SAT at 11pm on Wednesday the 27th of July, just about when Phantogram was finishing up their act before the Glitch Mob. What was initially most striking about this venue was the stage setup: each group member camouflaged in smoke, lit up by these crooked blue LED displays, giving the place a futuristic feel. 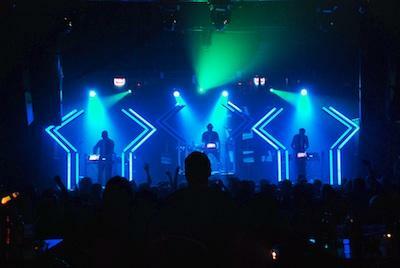 In fact, it was only once the Los Angeles trio came on stage that I remembered that the Glitch Mob had remixed a Daft Punk song from the Tron Legacy soundtrack: hence the edgy décor. Equipped with drum pads, touch screen machines and mixers, the EDM group started off with some hard dubstep, mashing in beats from hip-hop and rap songs. My friend had told me once that if you like bass, go and see the Glitch Mob. I could not deny that my core was responding to the pulse of these intense low frequencies. The warehouse was packed, and heating up as every track built up seamlessly to the next. It was exciting because of the musical progression – by the time their newest single “Warrior Concerto” started, frantic violins over a 8 bit synth bassline, most of us were just standing there in awe, just to focus and listen. I went to see the Glitch Mob expecting a more typical EDM venue with a lot of dancing and the occasional climactic point in the mix. But the Glitch Mob really blew me away with their singular style and perspective of dubstep, electro, industrial, hip-hop, even implementing classical forms! They gave an intense performance complete with constant engulfing and piercing electro sounds, so it makes sense that the show lasted an hour. I hope to see these stylish musicians with their hats and ties return to Montreal. Their new EP “We Can Make The World Stop” can be ordered online, the vinyl artwork is pretty interesting! This entry was posted in Reviews and tagged Lili La Stagiaire, Montreal, Phantogram, SAT, Show Review, The Glitch Mob on July 29, 2011 by admin.